Outlander's dramatic season three finale irrevocably changed things for a lot of our favorite characters - in addition to that Geillis Duncan situation, we see Claire and Jamie survive an epic hurricane, for starters - which naturally has fans wondering what's to come in season four. Well, thanks to a brand new teaser, we now have a good idea! Claire and Jamie's new American dream definitely looks a bit more dangerous than we were anticipating. 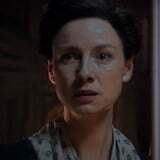 The brief glimpse into season four shows the reunited pair deciding whether or not they'll be able to make it in America, meeting Jamie's aunt, and other parts of Diana Gabaldon's fourth novel in the time-traveling series, Drums of Autumn. A concrete release date has yet to be unveiled, but the teaser does confirm that Outlander will return in November 2018! Check it out above, and then watch the first teaser that dropped a few months back below.